Hello! Today I have Cupcake Polish 'Oh Ship!' from the Seashells Collection to share with you. I'm not even slightly ashamed to admit that I bought this mainly for the name, it gets me every time! After swatching this, I couldn't resist some quick stamping over the top. Read on for my full swatchmore info! 'Oh Ship!' 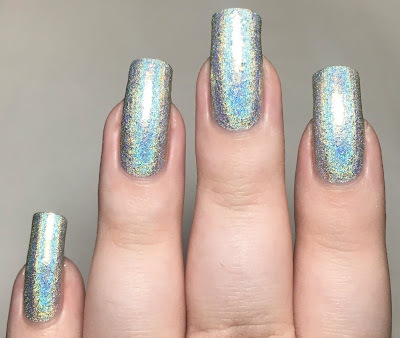 is a silver linear holographic with irridescent glitters. The glitters seem to mainly shift between orange and red for me, but I can also spot the odd flash of green. This has a smooth and easy to apply formula, and builds up to be opaque in two quick coats. Below is two coats with topcoat. 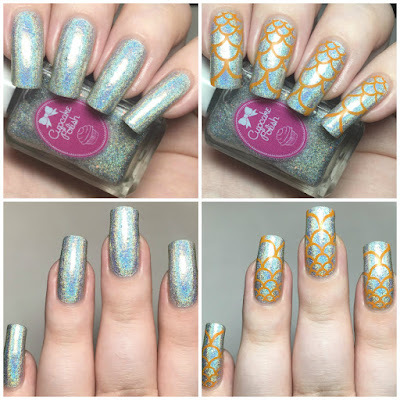 For my stamping, I used Uberchic Beauty plate Fairytale-02. I felt like something simple, and settled on the scale pattern towards the top right of the plate. 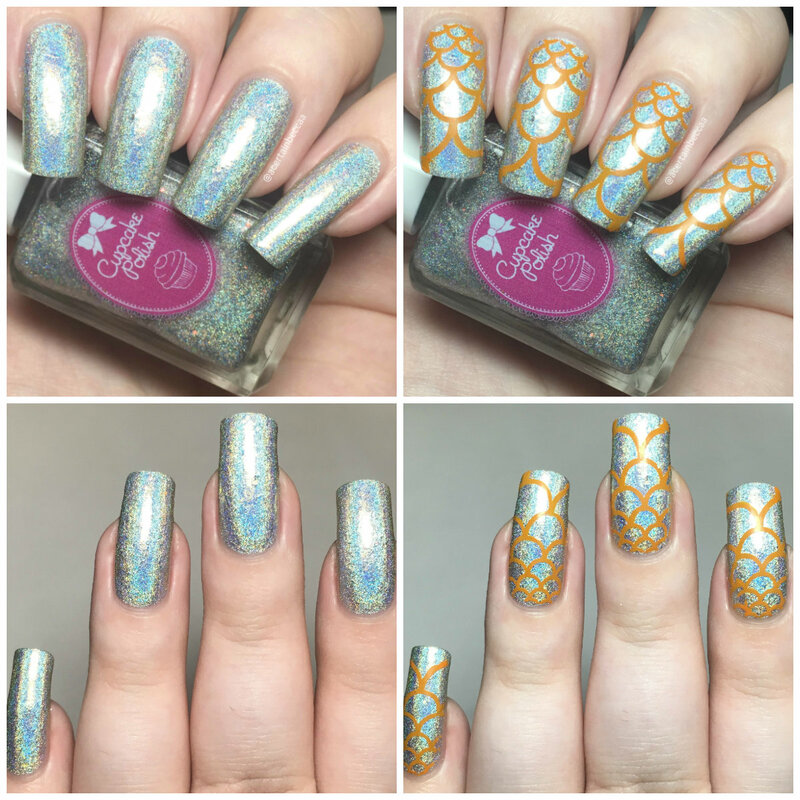 I wanted to match the colours I could see in the irridescent glitter, so used an orange stamping polish from Born Pretty Store. What do you think? 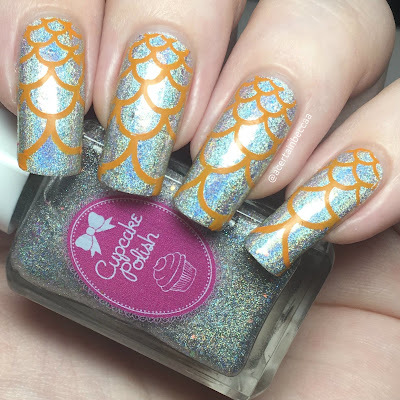 I'm not often drawn to silver polishes, but the combination of the irridescent glitters and the name 'Oh Ship!' had me sold! I'm really glad I picked it up as it is gorgeous on the nail. The holographic is ridiculously strong! 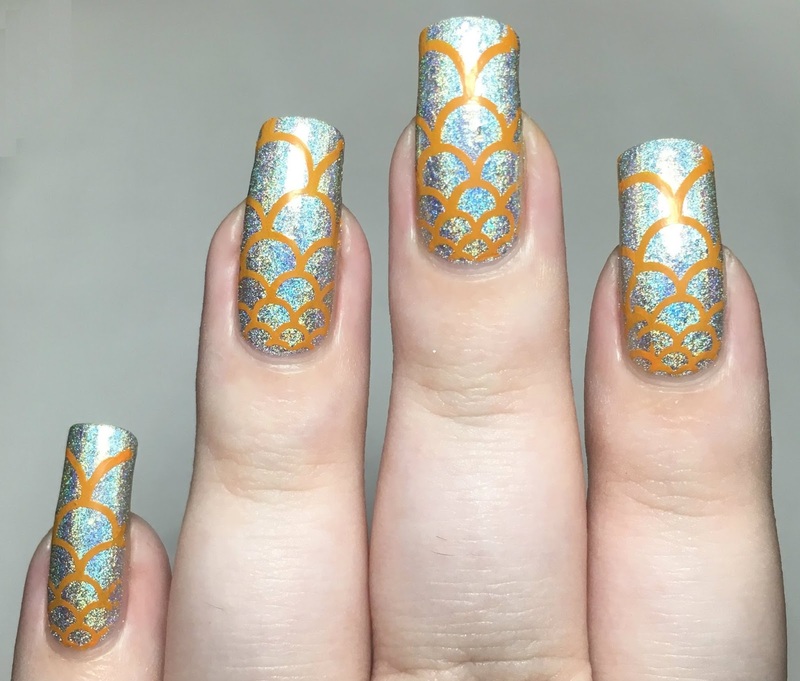 I also quite like the stamping - LeasNails mentioned it looked like goldfish scales so I'm going to roll with that. I purchased both 'Oh Ship!' and plate Fairytale-02 from Rainbow Connection. 'Oh Ship!' is currently out of stock, but is available on the Cupcake Polish website here.